Kolby touring the old city hall basement jail in 2015, left. Padded cell door exterior, right. Exciting news! The Whatcom Museum has opened the former jail in the basement of the old city hall building to the public! Back in 2015, we had the privilege of giving tours of the basement at a museum event and can vouch that there are great stories about the old jail awaiting you. Given that much of the subject matter on our tours involves lawbreaking folks, we have always been particularly interested in the jail, and in particular about the experiences of women in the legal system. On our Downtown Sin and Gin Tours, we discuss the creation of the women’s ward in the jail, and the hiring of female wardens. During the boom years of the 1890’s, the town of New Whatcom commissioned a new city hall on Prospect Street in an attempt to look fancier than their rival town of Fairhaven. The basement of the building was to be the new city jail. City hall and neighboring fire station, left. Fire Insurance map showing “calaboose,” (jail) in Fairhaven, 1890, right. The new city jail contained a free-standing steel cage with 2 cells as well as a “dungeon” for the prisoners. Women who were arrested were usually put in “solitary” to keep them separated from the male prisoners. Apparently there was an assumption that there wouldn’t be more than one female prisoner and that if there was one, they wouldn’t be there for long. In December of 1908 the jail hosted one famous (or perhaps infamous) female prisoner when the “High Priestess of Anarchy,” Emma Goldman came to town. A writer and lecturer on anarchist philosophy, women's rights, and social issues, Goldman was on a speaking tour of the west and was scheduled to speak at the Bellingham Theater. Mayor DeMattos was having none of it and ordered her to be arrested on the charge of “attempting to incite a riot.” She spent the night in jail, her bond fixed at $5,000, and was ordered to leave town the following day. After whiskey bottles were found in the women’s ward in 1909, jailers lamented the need to put heavy screens over the already barred windows of the building. They also continued to worry about potential breakouts - “a woman handy with a hammer and saw, both of which could be smuggled in through the windows, would have no trouble in demolishing the side of the jail wall and making her escape.” We found no records of women breaking out of jail through the walls, though one or two managed to walk out the door. Male prisoners on the other hand, did attempt to chisel their way out on more than one occasion, with varying results. Coinciding with these efforts Miss Ella L. Belyea petitioned the city for a position on the police force. Ella had been working for the newly organized Y.W.C.A. of Bellingham and had made it her mission to intercept young women arriving at the train station to make sure they didn’t fall into the “wrong line” of employment - perhaps a legitimate concern given that the Red Light District was directly across the tracks from the station. Ella Belyea became the first woman to fill a position on the Police Department. Job competition was not exactly stiff. The Herald reported that the city had been “flooded” with applications for other civil service positions such as truant officer and water inspector. Not one person other than Miss Belyea applied for the position of Police Matron. As the moral crusade to clean up the old wild-west ways continued, the Municipal League began to agitate for the closure of the city’s Red Light District, and State Legislature passed a "local option" bill giving each municipality the right to ban saloon operations within their city limits. Almost simultaneously in 1910 Bellingham voted not only to shut down the Red Light District but to go “dry” as well. The police department suddenly had their hands full to overflowing with criminals of all sorts. An ordinance requiring compulsory jail time for the sale of liquor was creating a glut of prisoners, and women were suddenly being arrested for both prostitution and liquor violations. “…RIVER 1930… DRUNK 30 DAYS” Historical Graffiti in Bellingham’s old jail in the basement of old city hall, now home of the Whatcom Museum of History and Art. A mere year after becoming police matron, Ella Belyea left for the east coast where she took a job as superintendent of a large orphanage. The department hired Edith Fuller, a kindergarten teacher who lived with her aged mother, to replace her. No sooner had Edith been hired than the City of Bellingham declared the need for budget cutbacks and the matron position was on the line. Women’s groups such as the Y.W.C.A. demanded the retention of the position, however Edith left on her own after she was offered a better paying job by the Yakima police department. The Bellingham department was not inclined to hire a replacement matron, since they already had two men on voluntary leave of absence. The city was having a hard time adjusting to the enormous loss of revenue from saloon licenses and the Red Light District, along with the need to increase policing of these newly criminalized populations. The jail situation had only gotten worse. Women’s clubs again voiced their demands for a police matron, and the city soon persuaded Edith Fuller to come back and resume the job; presumably offering better pay. Edith’s job not only involved dealing with female prisoners, she was also a “protective officer,” expected to keep young women out of trouble in the first place. Edith continued Ella Bellyea’s efforts at intercepting women at the train station, as well as inspecting theaters and dance halls for any hanky-panky. 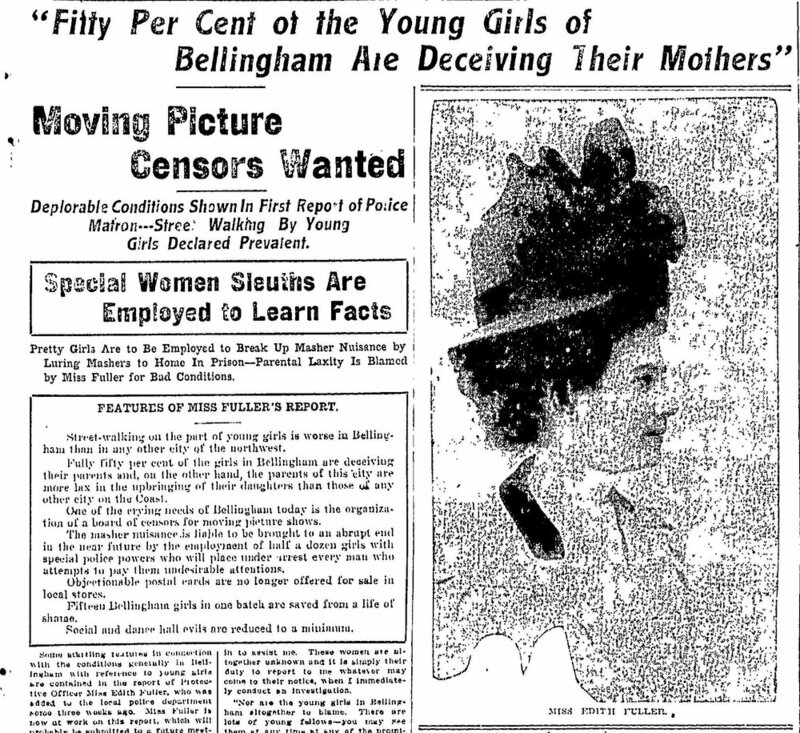 Edith’s initial assessment of the situation of Bellingham’s young ladies was rather dire, telling the Herald that 50% of girls were “deceiving their mothers,” while blaming parents for being too lax. Edith called for help in censoring moving pictures and was supposedly planning to deputize “pretty girls” to help quell the “masher nuisance” by arresting any man who paid them unwanted attentions. Edith’s protective work reportedly had such good results; the department received nation-wide attention and inquiries about her methods. Despite all her efforts and good results, the city jail continued receiving “fallen women” with regularity. With agitation from Edith, conditions in the jail saw minor improvements in 1913 when the women’s ward got a private “lavatory,” consisting of a toilet and sink with cold water only. A few years later the jail reportedly housed six women in a space designed for two with a cement floor damp from water seepage. Edith lobbied for the installment a wooden floor and enough sleeping accommodations for three people, a heater and access to hot water (provided by the chief in buckets). Edith remained on the force for five more years. In 1926 Edith retired at age 49, after her marriage to the widower Reverend Luther J. Covington. The city hired Mrs. Charlotte E. Strong as Edith’s replacement. Mrs. Charlotte Strong looks as if she could handle herself, but what’s with publishing her address….? In 1932 as prohibition wound down the small room used as a “liquor vault” was made over into a padded cell. Despite clearing out the booze and presumably fewer alcohol related arrests, the jail was still squeezed for space. With accommodations for 8-10 prisoners maximum, overflow prisoners were regularly sent to the county jail. Women who were jailed still lacked access to bathing facilities, sometimes confined for over a week without more than a sink and bucket to wash with. City hall was built in 1938-1939 on Lottie Street with a new bigger jail. Of course the shiny new jail didn’t stay cushy for long. Overcrowding and poor conditions in the city jail have been a continuous problem over the years and budgets never seem to be enough to improve things for long. There are still fewer women arrested than men, and still fewer women working in law enforcement, and these women’s stories are perhaps still heard less often. As the saying goes, the more things change, the more they stay the same. Note: The header photo of a jail cage is not from the actual jail, but it is the same type of free-standing metal cage cells they would have had. The matchbook below is likely a gag… if anyone knows more about it message us!